It’s true! Most prospecting plans fail! But it doesn’t have to be that way! If you can identify why they fail, you can make sure you plan better for success! 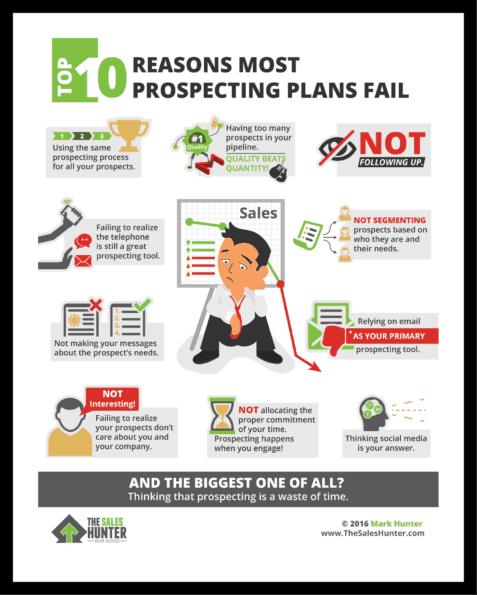 This free infographic outlines the 10 most common reasons prospecting plans fail. You may be familiar with a few of these, but I have no doubt a few will be new to you. Your time is valuable! You have to know how to prospect effectively if you want to have any lasting success in sales.